Please take a moment to visit my new sponsor, The Fat Finch-Roberta Beyer's wonderful shop for all things birdie! She carries everything you need for serious birding, whether its feeders, birdbaths, books or food to bird-related home-goods, paper, toys and kids, jewelry and gifts. 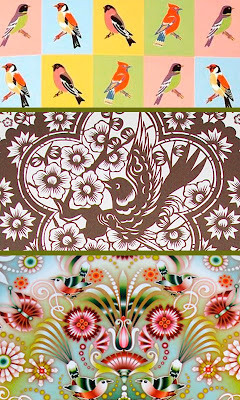 I especially love her colorful bird giftwrap paper and everything Charlie Harper. Thanks Roberta! Katie Runnels"birds", "brick and mortar", "online shops", "sponsor"